Strolling along Coffee Pot, casting your lines into the sparkling bay waters, or grabbing lunch dockside by what will one day be our new pier, you will be accompanied by a constant companion: the ubiquitous Brown Pelican. These birds are found everywhere, pestering fisherman for their catch, perched on one of the many docks that line the bay, and gliding effortlessly only inches above our waters. These birds are synonymous with life here in the Old Northeast. Brown pelicans are unique creatures. They are the smallest species of pelican in the world. They are also the only pelicans that hunt by diving from heights as high as 60 feet, attempting to scoop up fish along with 3 gallons of seawater by the mouthful. After they dive, small openings at the back of their beaks allow for the water to escape, leaving only the bait fish to consume. 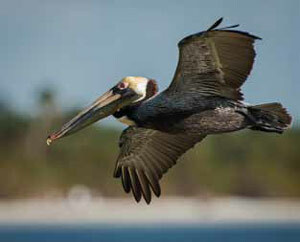 I’ve always wondered how pelicans are able to withstand a dive from those heights and not get injured in the process. Well, it turns out that brown pelicans come equipped with nature’s version of an airbag – small sacs of air under their skin protect them from the force of crashing into the water. Pelicans have been around for roughly 40 million years. Comparing that with us humans, we’re only a blip on the evolutionary screen having popped up a mere 200,000 years ago. 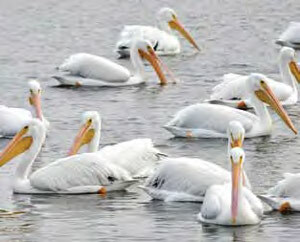 There are eight species of pelicans worldwide, and they are found on every continent with the exception of Antarctica. Pelicans are generally divided into two sub-groups: those which nest in trees – like our brown pelican friends on Bird Island – and those which nest on the ground. Pelicans range in size from the smallest brown pelican weighing in at as little as 6 pounds, with a wingspan of 6- 8 feet, all the way up to the largest of the species which is the Dalmatian Pelican, found from Southeastern Europe all the way to China, and weigh in at an astounding 33 pounds, with nearly a 12-foot wingspan. Florida is home to two species of pelicans, the familiar brown pelican and the White Pelican. These larger pelicans can weigh up to 11 pounds, with wingspans in the 8 to 10-foot range, and can be found as far north as Fort Smith in the Northwest Territories of Canada, a mere 3,600-hundred-mile journey from St. Pete. Much like their human counterparts, they love to winter in the warmer weather and can be found from the sunny shores of Florida to the Central American coasts of Panama. We share the waters of Tampa Bay and the Gulf with our pelican friends, but this species was nearly killed off by the loss of its coastal habitats, hunting, and pesticides to the point of extinction. What an absolute shame it would have been after surviving for 40 million years only to face their demise because of human influence. During the 1960s, the population had severely dwindled to the point that, in 1970, the brown pelican was added to the Endangered Species Preservation Act, which was the precursor to the Endangered Species Act of 1973. Thankfully, by 2009 their numbers had soared and they were removed from the endangered species list altogether. This isn’t to say that our city’s symbol is safe. These birds depend on the health of our coastal waterways for their survival. Their habitat faces a constant onslaught from development, oil and sewage spills, and pollution. These birds are beautiful and synonymous with coastal communities such as ours. Other threats exist as well. As many as 50,000 of these birds die annually from avian botulism, which is caused by eating diseased fish in ‘dead’ waterways that have become devoid of oxygen. Another killer is caused by fishing… not the act in itself, but the discarding of fishing line. Some estimates claim that four out of five pelicans will become entangled in fishing lines during their lifetime. Unfortunately, fishing lines can cut through a pelican’s wing tissue or become entangled and inhibit its ability to hunt and survive. 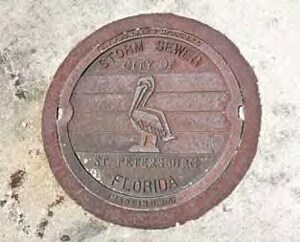 Pelicans can be found everywhere in St. Pete. We find its representation in our local shops, on postcards, and on our city vehicles. Maybe most importantly, they are a symbol of our relationship with nature, its beauty, its ability to regenerate and recover, and our unavoidable link with its health. Let’s take care of our pelican friends, and make sure their habitat stays viable, and that our shared waterways stay healthy. A healthy pelican population bodes well for the city we all call home. We are tied to the health of our waters, as is the pelican. Let’s continue to work to ensure both continue to thrive.